Kokeshi dolls are wood-crafted Japanese dolls that look not unlike the High Priestess kokeshi featured above on the box cover of the Kokeshi Tarot by Arlain. 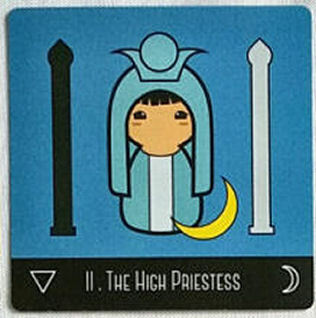 The Kokeshi Tarot stylizes traditional Rider-Waite-Smith tarot iconography into kokeshi dolls and the results are too cute to handle. 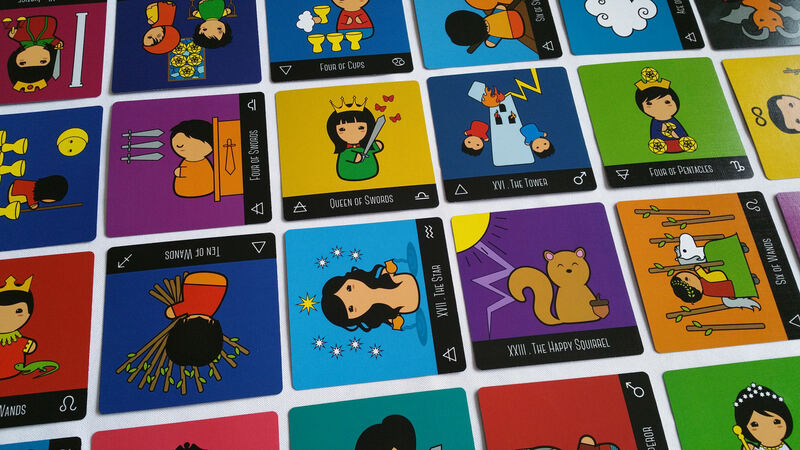 We’ve got reversible, symmetrical card backs, which are going to be relevant when we consider reversals and even–gasp!–reading with sideways cards. More on that later. 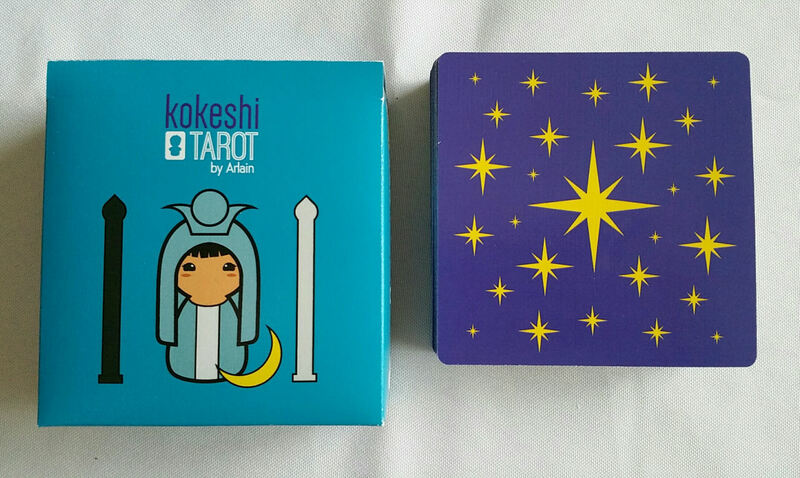 Let’s talk about the Kokeshi Tarot. If you’re familiar with the RWS system, then using this deck will be a no-brainer. Oh wait–what’s that card I see in the photo above? The Happy Squirrel! Awww! I always squeal with delight when I see the Happy Squirrel card. The deck is self-published through GameCrafter, a print on demand service, which generally isn’t my favorite, but GC did a great job with this particular deck. At first I thought the solid-colored backgrounds were coded per element, but it doesn’t seem so. No matter–it’s adorable. 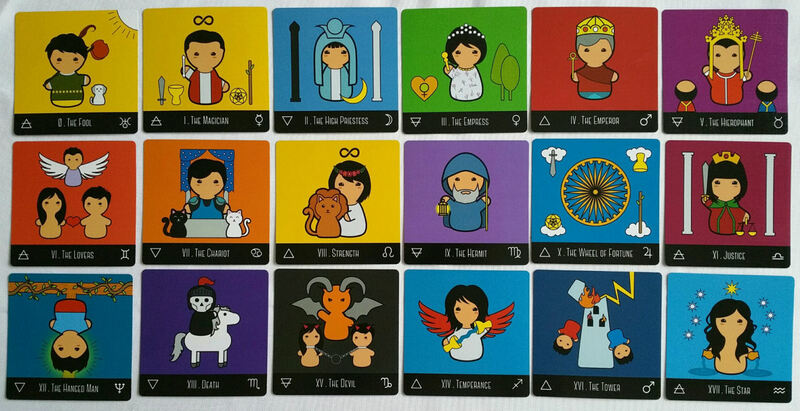 There does still seem to be a methodology of color symbolism going on, and color correspondences as chosen by the deck creator are intentional, to help you learn the card meanings or at least intuit the emotions and feelings of each card. I love the cartoony feel of the art style here and works perfectly with the kokeshi theme. 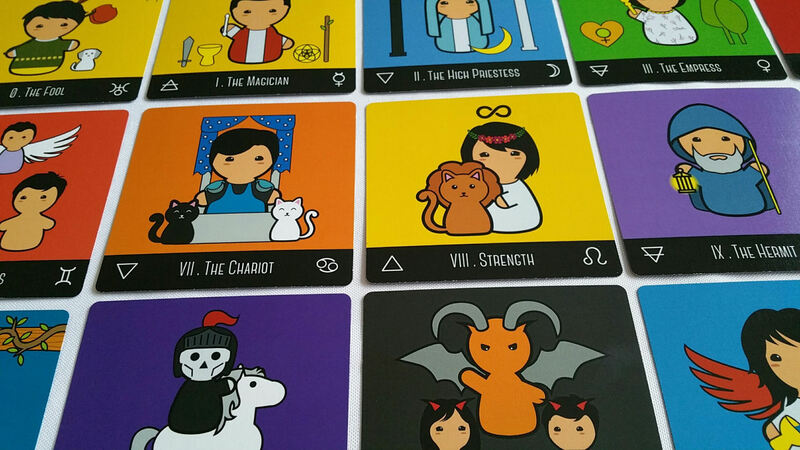 Yet there’s substance here–this tarot deck isn’t here just for the kawaii effect. You get the alchemical symbols for the corresponding elements and the astrological assignments at the bottom of each card. Although this might not be the deck I reach for to do a professional tarot reading, I think it’s perfect to bring to the Christmas, winter holiday, and New Year’s Eve parties I’ll be attending! You can still extract some serious divinatory insights from the deck. It’s more a matter of form and mood-setting, so it’s still a perfect reading deck for light-hearted parties among friends. Me? I’m going to go with Earth and, hm, maybe Eris, since in the Simpson’s episode, the fortune teller did say that the Happy Squirrel card was very ominous! =D The dwarf planet Ceres might work, too, if you want to go in that “abundance, harvest” direction, which makes great sense given the squirrel reference. And that would still probably be the elemental Earth. Although the Minors don’t feature the decan rulers, you do get the zodiac sign associated with each pip card, which I dig. Typically Japanese kokeshi dolls don’t have arms and hands, though here we see that they’ve got arms and hands in the cartoon. I’m cool with that. It’s still super cute. The court cards in each suit seem to be color-coded. 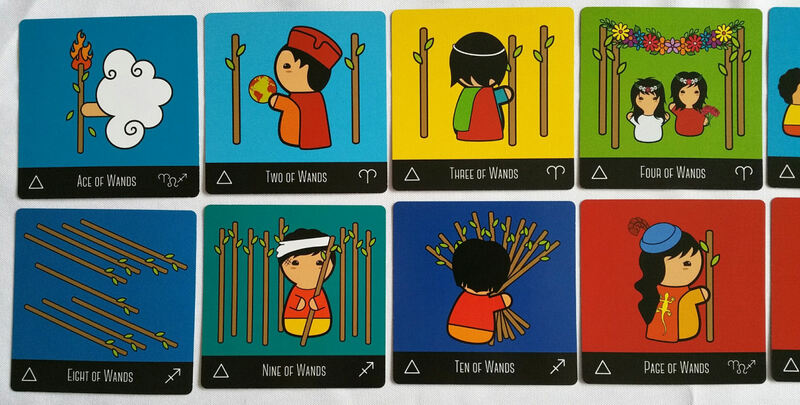 Here you see that all the courts in the suit of Wands has a red background. Later you’ll see that in Cups, it’s blue; in Swords, it’s yellow; and in Pentacles, it’s green. As I noted earlier, this is a very Rider-Waite-Smith deck, so it’s easy to read for any RWS reader. I love Arlain’s art style here. It’s whimsical, has that Kodomomuke anime art style, featuring bold colors, thick black outlines, and inspires happiness. 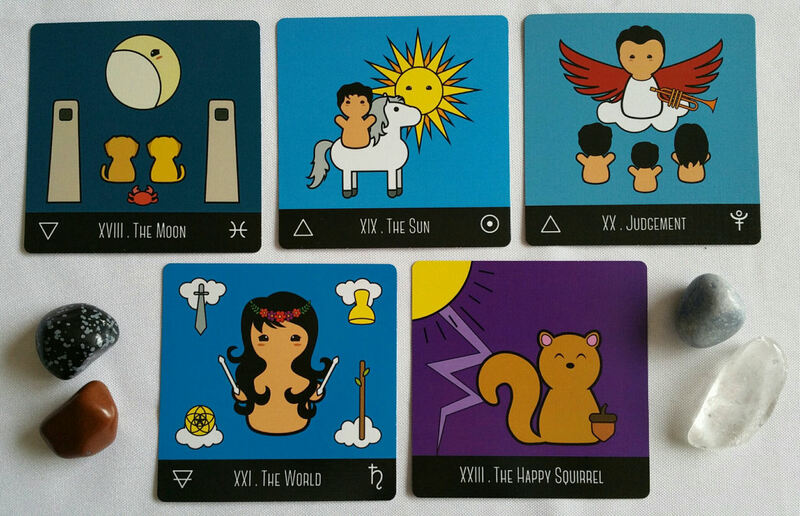 I can’t look at this tarot deck and not be happy. 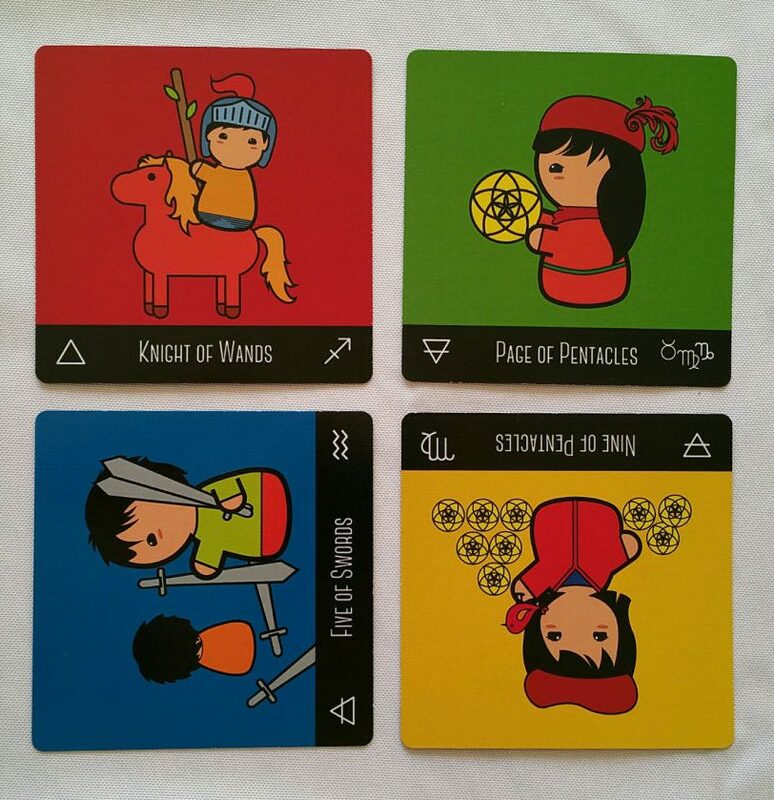 Omigosh that RWS Seven of Cups is too cute. I’m also loving the Queen of Cups in this deck and how she added the lotus. There are other details she’s added that I love, like the blood dripping from one of the swords in the Three of Swords, which you can see below. When you order the deck, it comes with a 48-page downloadable PDF guidebook, which comes in two languages. You can get it in English or in Spanish. Card meanings, keywords, and basic metaphysical correspondences for each card in the tarot deck structure is provided. 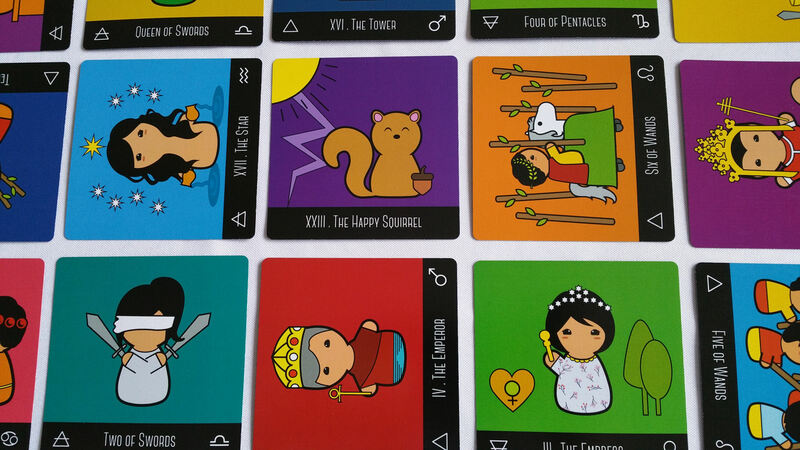 What does The Happy Squirrel card signify in the Kokeshi Tarot? It points to circumstances beyond our control, and the Universe acting on our behalf because the Universe is wiser. It’s about “the mysteries of this existence,” as it is put so aptly in the guidebook. Keywords for the Happy Squirrel? Universal wisdom; the unexpected; and mystery. Okay, now let me go over how I would read a tarot spread with these square-sized Kokeshi cards. I shuffle the deck thoroughly so that all four edges could be accounted for, and in a spread, a card could appear upright, reversed, facing left sideways, or facing right sideways. Here’s the system I devised for myself to read these four edges. 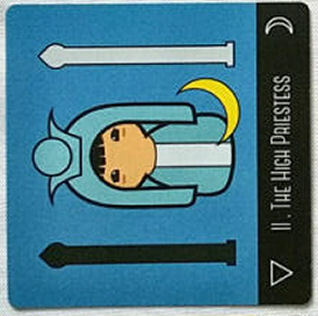 Upright Card: Inward or inbound energy or force at play. Energy is active. Invest more of your attention in this card compared to the non-upright cards in the spread. Reversed Card: External, externalized, or outbound energy or force at play. Untapped energy, or energy is passive, latent. Left-facing: Take with you into the future something from the past or pre-existing. Right-facing: Don’t look back; leave behind what hasn’t been serving you. 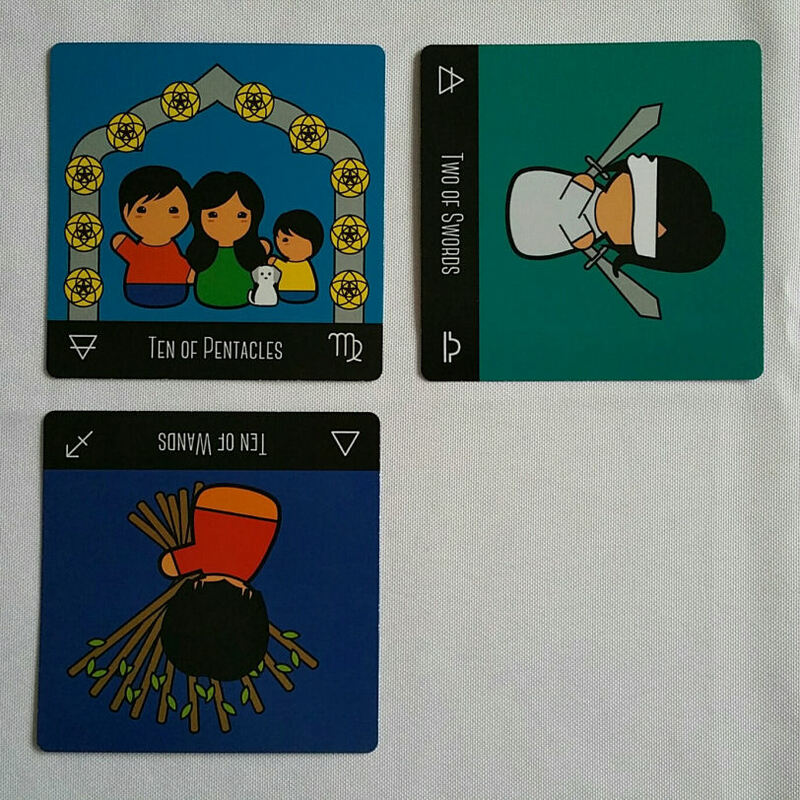 In the above projection reading for 2018, the four cards, right to left, represent IHVH, the four elements Fire, Water, Air, and Earth respectively, and four different themes. Fire, the right-most card in the row of four, will indicate work and labor force matters, employment, and general production issues for 2018. Water will indicate family matters, personal relationships, spirituality and religion in society, and emotional themes. Air will indicate political and governmental matters. Earth will indicate the global economy. Note how for labor and employment, we get the Eight of Pentacles upright. Upright, in the paradigm I’ve set here, means this is something we’ll want to pay more attention to in 2018 and career matters will be at the forefront of our physical lives. I do also see improvement in employment rate and healthy job prospects for the middle class. For family, spirituality, religion, and emotional themes as a global society, we see the Eight of Cups right-facing. Let’s leave behind what hasn’t been working for us and look forward to more innovative, creative, and inclusive ways of thinking about family relations, spirituality as a community, and our collective emotional health. For politics and government, the Ace of Cups is in reverse. I read this reversal as an omen that proactive change needs to take place. It’s about more forces being dormant than active, and harms sustained are a result of not optimizing the potential. For the economy, we see the Seven of Swords upright. Like the upright Eight of Pentacles we saw for labor and employment, economic issues will also be at the forefront of our attentions in 2018. Basically, work and financial security are what we as a collective may be most anxious about. Then, of course, I’d go about reading the actual card drawn, filtered through the lens of the positioning of the card–upright, reversed, sideways left, or sideways right. 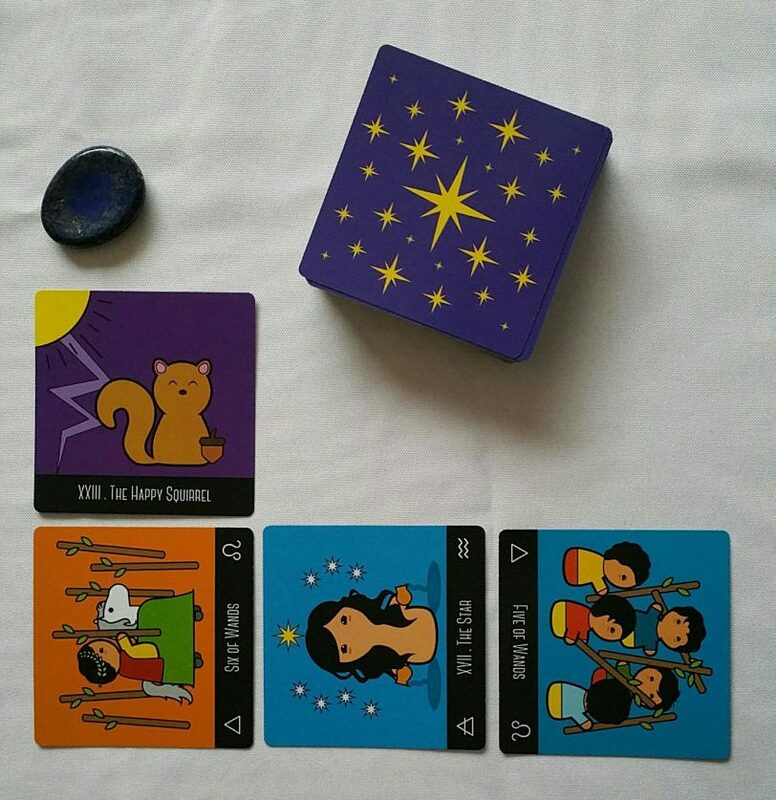 Here’s a cool way I read with the Kokeshi Tarot and use the deck’s own layout to help me create a tarot spread. All right. In the above, I started the tarot reading by drawing a single card, and it was The Hierophant facing right. You can see it in the way left side of the photograph. 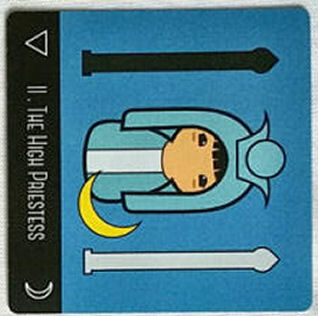 Since the Hierophant faces right, I draw a card to its right, which was the Queen of Swords upright. Here’s a fun thing I would do with the courts. Upright, I’m going to read the court as an actual person, a character, in the seeker’s life. In reverse, I’m going to read the court as a facet of the seeker’s personality. I change up my normal way of reading courts and devise a specific system just for this square deck. So here, the Queen of Swords is going to represent an actual person who is affecting the situation. Now, since the Queen of Swords faces upright, the black bar at the bottom, I draw a card below her. Now we get The Magician sideways right, the black bar right-ward. So I draw another card to its right, and continue, guided by the last card to know where to position the next card. 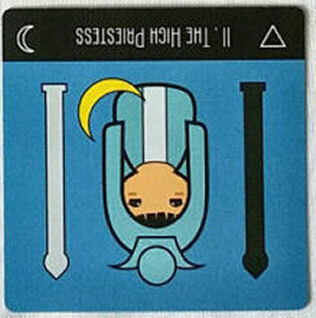 This continues until near the end, the Two of Cups reversed is followed by an upright Wheel of Fortune. The two black horizontal bars of the Two of Cups and Wheel of Fortune “face off” and block each other. So that’s how I know when to stop adding cards to my tarot spread. 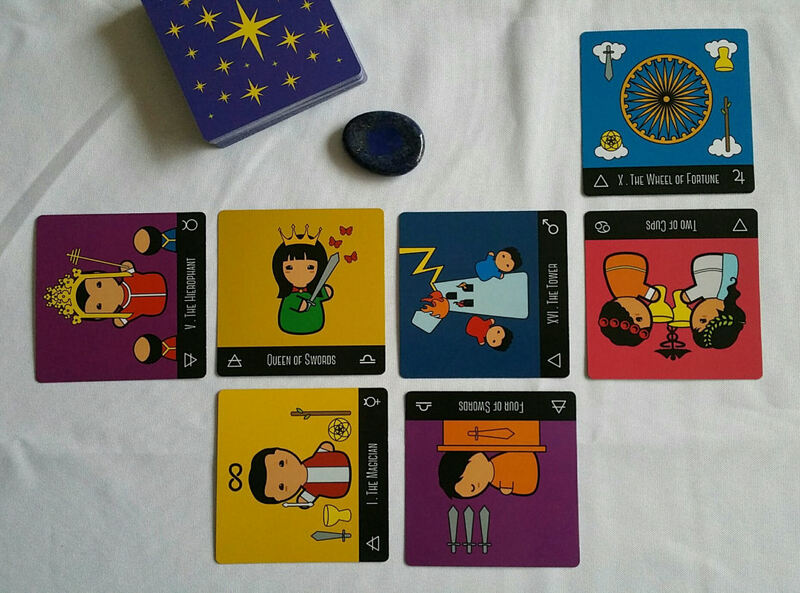 Now I read the spread created and the order I read the cards follows the order I drew them into the spread. The above is an example of a three-card spread. I started by drawing one card, which was the Two of Swords facing left sideways. So I draw a card to its left, the Ten of Pentacles upright. I draw a card below it, following the black bar, and we get a “face off,” the Ten of Wands reversed. That’s how I know to end, and now I have a three-card reading. 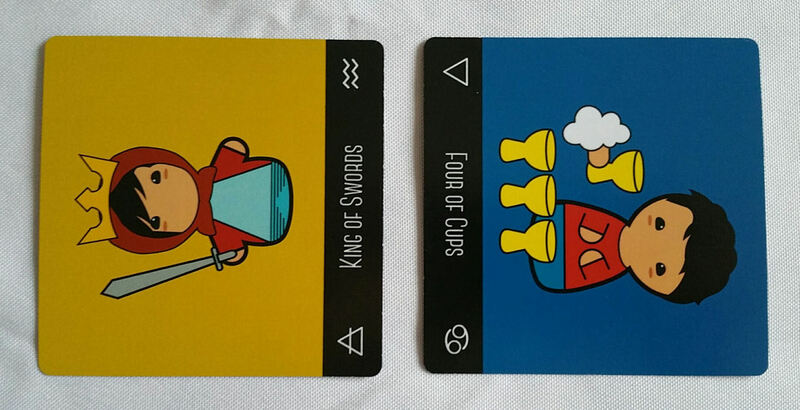 Here’s a four-card spread. I start the reading by drawing one card, which was The Happy Squirrel upright. Since it’s upright, with the black bar at the bottom, I draw a card below the Happy Squirrel, which was the Six of Wands facing sideways right, so I draw a card following the directionality, got the Star sideways right again, follow directionality, and then we get that “face off” ending with the Five of Wands. I then do the four-card reading, observing the four-way directionality. The above is an example of another four-card reading, starting with the Knight of Wands. 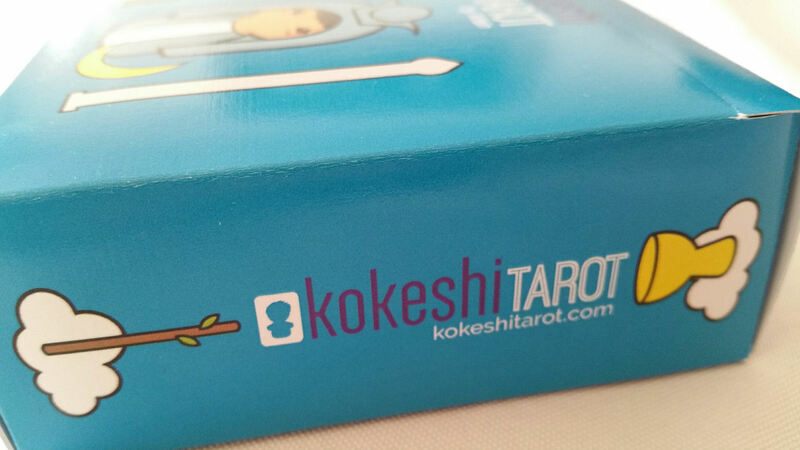 Learn more about the deck here, kokeshitarot.com. Order your copy today through GameCrafter, here. By the way, the deck creator herself has a fascinating background. Check out more of Carolina’s work here. 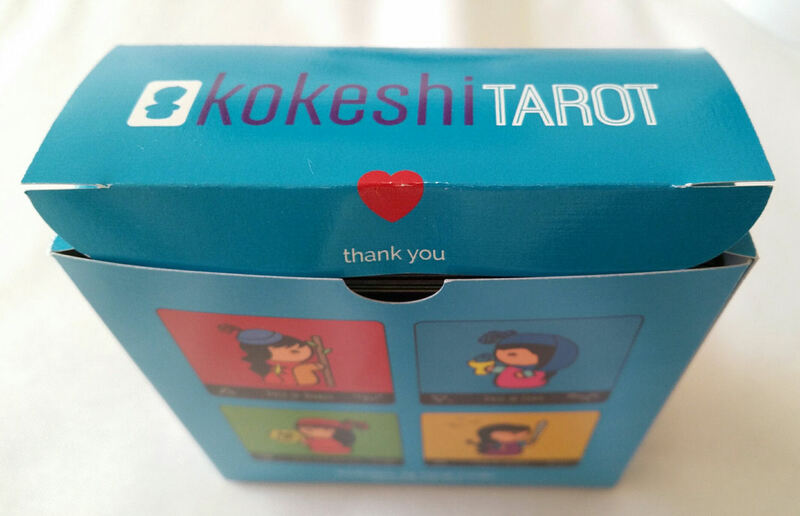 FTC Disclosure: In accordance with Title 16 of the U.S. Code of Federal Regulations Part 255, “Guides Concerning Use of Endorsements and Testimonials in Advertising,” I received Kokeshi Tarot from the deck creator for prospective review. Everything I’ve said here is sincere and accurately reflects my opinion of the deck.